How many ways are there to make CHICKEN? Probably a million, but nothing beats a perfectly roasted chicken especially on a Sunday afternoon. I’ve been told I’m addicted to cooking roasted meats on a Sunday and I think my family is right. There’s just something about slow cooking a meal while watching my favorite sports team. Whether a roast, stew, or chicken I’m never disappointed. This recipe is sure to never disappoint and if you follow the Chef Secrets-Chicken listed your chicken will be perfect every time! Bring the chicken to room temperature by removing it from the refrigerator for at least 30 minutes prior to cooking. Season the inside of the chicken with salt and pepper and fill the cavity with the onion, garlic, lemon and fresh herbs. Tie the legs and tuck the wings on the bird and completely dry the outside of the bird. Rub the olive oil on the skin of the bird and season with salt and pepper. Place the bird on its breast and roast on a cooking rack for 15 minutes on high heat. Reduce the heat to 350 degrees and rotate the chicken on the right side, basting and cooking for 15-20 minutes. Rotate the chicken to the left side, baste and continue cooking. 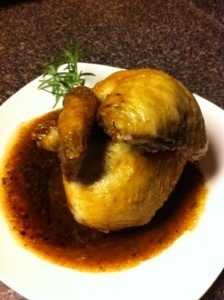 Rotate the chicken to its back, baste, and cook until the total cooking time reaches 1 hour. Roast until the internal temperature reaches 165 between the thigh and breast. Remove the chicken from the oven to rest for at least 15 minutes before carving. Place the roasting pan on a burner on high heat. Stir in the white wine scrapping all the drippings from the tray. Add the chicken stock and simmer for 5-7 minutes to reduce the sauce. Add the rosemary to the sauce and season with salt and pepper. Reduce the heat and stir in the cold butter to thicken the sauce and serve.